It's got a shop and hotel and a youth hostel, plus other accommodation, but most importantly, this little route-centre settlement has got a railway station and is a railway junction. Trains from Glasgow that arrive here go either west to Oban or north for Fort William. It's also where the main road from Glasgow and the main road from Edinburgh meet, if you are a traveller heading west, say, to Oban or Fort William and all the delectable places around. Here are some pictures of the setting of Crianlarich, typical of the southern or central Highlands of Scotland. At the junction of three glens – Glen Falloch, Glen Dochart and Strath Fillan – Crianlarich is a natural route centre. It’s not a ‘must see’; actually more of a ‘hard to avoid’ if you are touring westwards. These days, if travelling by car, you now have to actually go into the village, as it has been bypassed. Ringed by big hills, Crianlarich has a good number of Munros (Scottish mountains over 3000ft [914m]) within easy reach and these are a dominant feature. There are at least seven within five miles (eight km) to the south and east, with dozens more within a few minutes’ drive. The pictures below on this page are (untypically) 35mm transparencies of mature years, scanned with love, care and a proliferation of dust specks that had to be puffed off. Grrr. Still, as I may have said elsewhere - you're worth it. I like the cool blues though – it suits the mood of spring in the Highlands. (Pictured here) Reflecting in the river, Ben More is a major feature of the scenery around Crianlarich. Simply the ‘big mountain’ in Gaelic, it certainly feels big if you climb it from this side. You more or less relentlessly slog up by the left-hand skyline, which is the north side, keeping well away from the shallow corrie (hollow) seen on the face here near the top – as it can be avalanche prone. (Pictured here) Behind the village, looking south, are the ‘Crianlarich Munros’ – Cruach Ardrain prominent. Easily day-trippable for walkers from most parts of the central belt of Scotland. 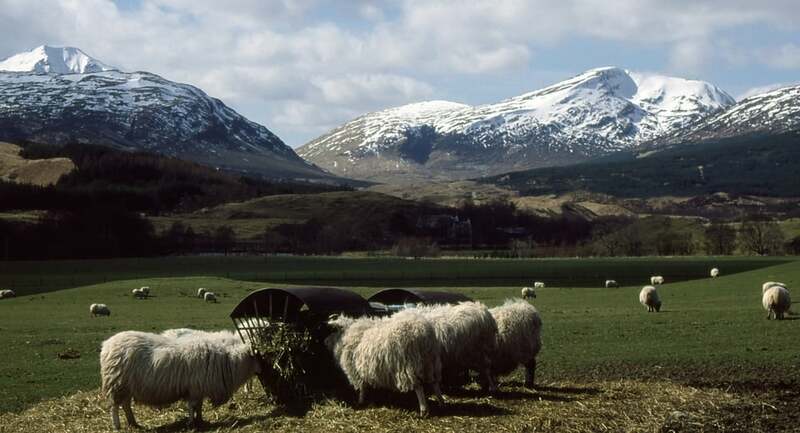 (Pictured here) On the West Highland Way, in early spring (with hungry sheep), Ben Lui top left. Crianlarich is an important stopping off point on the West Highland Way, running 95 miles (152km) from Milngavie near Glasgow to Fort William. The Way can be picked up by following the signposted path which starts on the far side of the road, opposite the station. The photograph here is taken on the route as it approaches Kirkton Farm, north of the main A82 and west of Crianlarich. Ben Lui (Gaelic: calf hill) is just visible on the left – sometimes described as one of the finest mountains of the Southern Highlands. By this point, the West Highland Way has emerged from thick woods and the views have opened up. Within easy reach, Glen Orchy, with great river scenery, is worth seeking out if you are touring from Crianlarich. It's a pleasant alternative to the main road. As well as attractive Highland scenery, it’s got walks and trails and picnic places by the river. It's featured on the header of this page. If coming from south then Crianlarich is on the road to a lot of places, including the islands of Skye and Mull. And it's on the road from Loch Lomond. The main road west of Crianlarich goes through Strath Fillan, taking its name from the Gaelic srath, a river plain or broad valley, and St Fillan, an early missionary from Ireland. He spread Christianity throughout the Highlands in the 7th century and built a cell by the River Fillan. Legend says his left arm gave off its own light. This saved him a fortune in candles and enabled him to sit up all night transcribing religious material, presumably illuminated manuscripts. Historically, the first rails to reach Crianlarich were on their way west for the seaboard at Oban by 1880. The line was worked by the Caledonian Railway. Their rivals, the North British Railway, then arrived at Crianlarich about fourteen years later, en route to Fort William. (Above) Crianlarich Station, looking south. Line heads down to Loch Lomond and Glasgow. The North British line reached Crianlarich heading north at right angles to, and at a higher level from, the earlier Oban-bound track. While the Caledonian ran east-west through Glen Dochart and into Strath Fillan, the North British had built their line by Loch Lomond and then steeply up Glen Falloch. A level section just south of Crianlarich became known as ‘the fireman’s rest’ – as generations of firemen shovelled coal for miles on the gradient to keep up steam, then got a short break as the train slowed for its Crianlarich stop. Rough, oh so rough, plan of Crianlarich station layout. Anyway, if you’ve followed this so far, with the help of another of these vivid, hi-tech, wonderfully illuminating graphics (or wee untidy sketches, as I call them) you can see that there were then lines going to the four points of the compass here. Eventually, the two rival companies decided to join them by a curving ‘spur’ (as railway folk call it). As it turned out, when the old Caledonian line from the east to this junction community was closed in 1965, the spur became vital – as all services to Oban had to go this way. That’s why Oban-bound trains depart north and suddenly lurch off to the left (westwards) to rumble down to the original line. You can see the connection, disappearing behind the white boxes, half-way along and to the left of the Fort William train (below). Yes, it is all a bit 'anoraky' - I agree. But it explains the importance of Crianlarich. 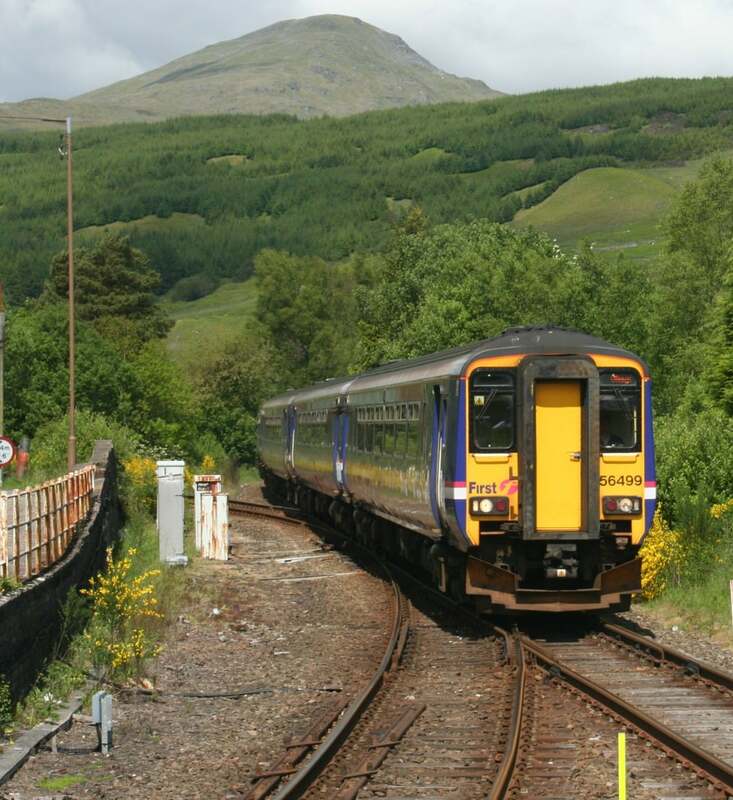 Fort William-bound rail service leaves Crianlarich. The Oban services go off to the left, beyond the white boxes/posts in this picture. I had time to mull all this over a few seasons ago, while waiting for my wife to depart on to a morning Fort William train that was then timetabled for 10.21. The ScotRail man on the platform had a dire warning about making sure we didn’t get on the next train through as that was going to Oban. Sure enough, a train appeared and we watched an old couple, with their equally old greyhound, bundle themselves on to it, then bundle themselves back off again in much haste and disorder. And there were a few near disasters for other rucksack-carrying visitors, who hesitated by the platform edge. Uncertainty hung around as an unwanted travelling companion. A platform announcement would have been nice. Perhaps that pantomime goes on every day in the summer when first time visitors of all nationalities find themselves making connections here. Crianlarich is not only where road and rail meet. Other business for the village arrives on foot, as it’s on the West Highland Way, the official Glasgow to Fort William footpath. Thirsty walkers come off the path and head for the station tearoom. This has been an institution for decades and, apparently has always been privately run. In the old days, the breakfast and luncheon baskets supplied to passengers were legendary. The café on my last visit - admittedly, a wee while ago now - is one of these places that communicates its way of doing things by lots of notices, especially about where to leave your rucksack. (Pictured here) Phew! Just as well I spotted this. The first thing I always do in a cafe is whip off my socks. What? No, really, I wouldn’t dream of taking my socks off in a café, would you? Obviously, this applies to foot-sore walkers on the wildly popular West Highland Way. The shortbread was nice though. Anyway, we had time to observe all this as the 10.21 service seemed to have vanished, so there was lots of time to admire the hills all around. Eventually, a service did arrive and my wife went on her journey. No explanation was forthcoming but the scenery was stunning, and the train full of appreciative visitors.